I hope you don't mind if I borrow this idea. He's make good prizes for our church party. My favorite set is Joy to the World followed by Mistletoe, but we all know all of Kimberley's stamps are great. Best of luck to you as you leave the team and focus on the family. Congrats Bobby! Please click HERE to contact me with your shipping info so we can get these fantastic stamps shipped to you!! Thank you again everyone for your encouragement and God Bless! Hello and welcome to your final stop of the Stamp Release Party Blog Hop for My Craft Spot!! This hop is a little bitter sweet for me. This will be my last hop as a My Craft Spot Design Team member. I have been blessed to work with Kimberly on her Design Team since the beginningand I have learned so many great paper crafting tips from her... but I've made the decision to stop posting on my blog by the end of the year in order to spend more time with my family! I will really miss my bloggy friends especially this incredible group of talented ladies but it is just something I feel my family needs right now. Thank you to all of you who have stopped by and left your sweet comments! I hope you have enjoyed all of the sneak peeks this week! The DT have worked so hard for this Stamp Release and today we are ending with a bang! Are you thrilled to see each of the new sets today? You should have arrived here from the talented Heather! If not, jump over to My Craft Spot to start from the beginning for your chance to win a set of the new stamps or dies at each stop! You will not want to miss a stop! I made a cute little 6" giftie box with the adorable penguin from Create A Critter. I added a little scarf using Maraschino Twinery Twine available at My Craft Spot, then made a simple box and popped the penguin off of it with pop-dots. I filled this little guy with some cold weather neccesities...tissues, lip gloss, hand santitizer, and hand lotion! My daughter thinks the tag is the best part of this guy! 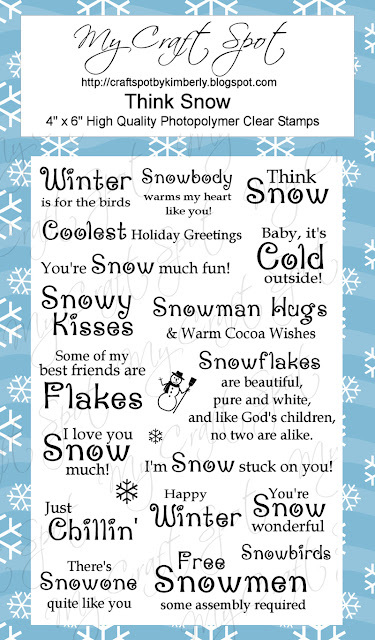 The adorable sentiment comes from the new Think Snow Stamp Set! The little tag is cut with one die from the new Lacy Banners Metal Dies and one from the Tiny Doilies Metal Dies. Speaking of the Think Snow set, who wants to win one of new Think Snow Stamp Sets!!! I am giving one set away to one lucky winner!!! Please leave me a comment letting me know which is your favorite new stamp set this week for your chance to win them! I'll announce the winner on Monday 11/12 so stop back to see if you've won! Thank you so much for hopping with us today! We hope you have been inspired!! There is a copy of the Blog Hop line-up below in case you got lost along the way or you can head to My Craft Spot to start shopping for these new beautiful stamp sets! Have a great day! Hello and welcome to Day 4 of the My Craft Spot Stamp Release Party week! 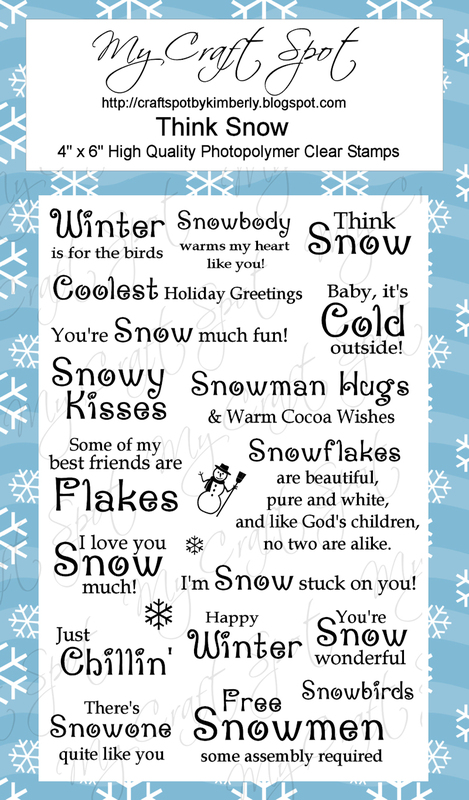 I'm happy you stopped by today to get a closer look at my sneak peek of the the new Think Snow stamp set! This set is another fun Winter set and to be honest, I can't decide which is my favorite!! Here is my sneak peek for today! Isn't this little snowman the cutest??? He is from Winter Frolic Cricut Cartridge (which goes very nicely with this new stamp set). I paired him up with some colorful pattern paper from the MME 12 Days of Christmas 6x6 paper pad and popped the layers with dimensionals. Stop by My Craft Spot for your chance to win another great prize today (New Arrival Stamp set) and for some more amazing Winter inspiration from the talented Kimberly as well as the My Craft Spot Design Team!! We can not wait for you to see the big reveal on Saturday! Thanks for stopping by today and please stop back again tomorrow for our last day of sneek peaks! Hello Everyone! Welcome to Day 3 of our week long Stamp Release Party at My Craft Spot! We are half way through the week and what do you think so far? Have you been inspired and are you excited for the big reveal on Saturday? Well, today we are sneak peeking the another new Christmas set called Joy to the World and what a beautiful set this is to have in your collection! Here is my sneak peek for you today! Christmas is a mere few weeks away, so if you haven't gotten started on those cards yet, now is a perfect time to start! I used the Christmas Cricut Cartridge which came preloaded on my Gypsy to cut this beautiful reindeer and the frames came from Once Upon A Princess. I added a trim to the frame with liquid pearl and embossed the white background with Swiss Dots to match. The ribbon accent is the Sheer White from the My Craft Spot Ribbon Assortment Pack. This lovely stamp is part of the new Joy to the World Stamp Set. Don't you love the beautiful font!! I hope this insires some beautiful Christmas cards for you! Today you have a chance to win 5 colors of Jute String just for leaving a comment at My Craft Spot on the Day 3 Stamp Release Post! All the new sets will be revealed and available for purchase on Saturday but make sure to check out all the beautiful projects today using Joy to the World at My Craft Spot! Thanks for stopping by today and please stop back again tomorrow for another sneak peek! Good morning everyone! Day 2 of the week long Stamp Release Party at My Craft Spot! Today we are sneak peeking another great stamp set! This set is called Stampin' Around Christmas and what a fun set it is! We LOVE Christmas at our house! It is one of those holidays that we have so much fun being creative making special gifts for our family and friends! For every gift, we need a tag so here is my sneak peek for today! This set works perfectly with the Tiny Doily Metal Dies available at My Craft Spot. I added a Cranberry Crinkle Ribbon Bow and some Natural Jute both avaialble at My Craft Spot. The little antique brad is an old one from Stampin' Up! I hope you enjoyed my sneak peek of the new Stampin' Around Christmas stamp set! There are more amazing sneak peeks from Kimberly and the Design Team over at My Craft Spot and if you liked the Tiny Doily Metal Dies used with the sneak peek today, this is your chance to win them! Kimberly is giving a set away just for leaving a comment on today's Stampin' Around Christmas sneak peek!!! All the new sets will be revealed and available for purchase on Saturday along with our fun Blog Hop! Thanks for stopping by today and please stop back again tomorrow! Hello! Hello! Hello! Are you ready for a fun week of sneak peeks, inspiration and great prizes? Today starts the week long Stamp Release Party at My Craft Spot ...woohoo!! Kimberly is releasing another group of amazing stamps and the DT has been having a blast playing around with them so we can show them off for you! Today's sneak peek is of the new stamp set called Chunky Alphabet and the new Lacy Banners Metal Dies...yes another metal die set...yay!!! Here is my sneak peek! We run to a birthday party almost every weekend so Birthday cards are a constant need in our house! The banners and circles for the letters were both cut from the new dies! I adhered them to the base, ran a quick double stitch around the outside border and viola...a quick and easy card thrown together for a party! I hope you enjoyed my card for today! Be sure to stop by My Craft Spot to see the amazing Sneak Peek projects made by Kimberly and the DT using the new Chunky Alphabet Stamp Set and Lacy Banners Metal Dies and for a chance to win a great prize today! There will be prizes given away for each day of the Stamp Release party and today Kimberly is giving away Vintage Christmas Crinkle Ribbon! All you need to do is stop by My Craft Spot and leave a comment! All the new sets will be revealed and available for purchase on Saturday along with our fun Blog Hop! Thanks for stopping by today and please stop back again tomorrow! Hello Everyone! 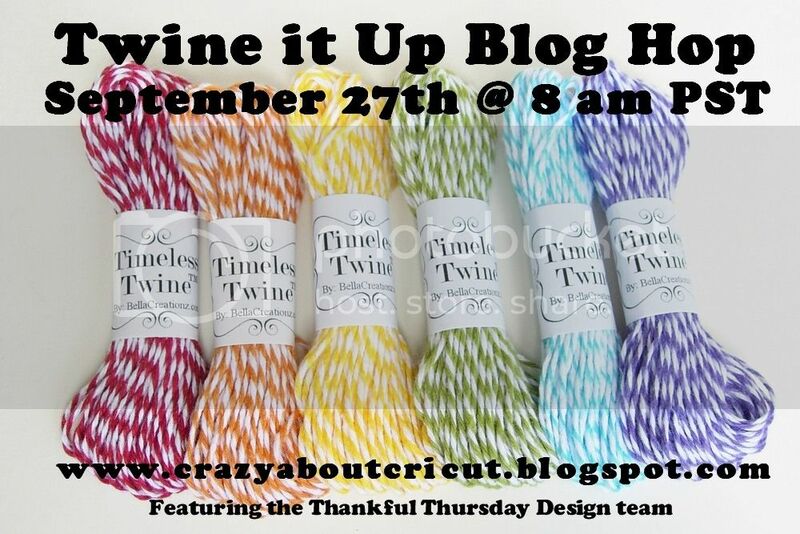 Welcome to the Twine it Up Blog Hop hosted by Jenny at Crazy about Cricut and the Thankful Thursday Design Team! Thankful Thursday is all about getting crafty with your kiddos (or loved ones)!! If you are coming from the talented Cheryl at Cards by CG then you are heading in the right direction! If not, stop by Crazy about Cricut to start from the beginning! This month Jenny has some great prizes for hopping, 10 yards of twine and some action wobbles...YAY!!! I'm going to keep this short and sweet because I'm having some blogger issues tonight. I haven't been on here since the update and I'm having problems with it! We made a cute little fall card using a Simply Betty Stamp that I found colored in my stash. It was from last fall! My girls LOVE using the Big Shot to emboss EVERYTHING so they worked on that part of our card. We tied on a simple Bow using Aqua Delight Timeless Twine. The ribbon and sentiment are from My Craft Spot. My girls thought this was the best part of the card! They love the action wobbles! Good morning! What a week last week! Thank you to everyone who joined us for the My Craft Spot Fall Stamp Release Party and for all your sweet comments! Today I have a winner to announce and I'll get right to it! Kimberly has given me a set of the new Ghostly Greetings Stamp Set to give away to one lucky winner!! Comment #6 - Paula Bee from Craft with Bee!!!!!!!!!!!!!!!! I just love these wreaths! I am going to have to give them a try! Congrats Paula and thank you again to everyone who visited! Paula, please click HERE to claim your new stamp set! Have a great day! I had so much fun creating the cone wreath on Monday, that I decided to create some Halloween wreaths for my daughters' teachers. I used Basic Grey Eerie pattern paper and the new My Craft Spot Stampin' Around Fall / Tiny Doilies Metal Dies sets! The possiblities of dimension on the Tiny Doilies Metal Dies are so much fun to play around with! Below are the other two wreaths! So, who is excited for some Blog Candy?!?! I am giving away the new Ghostly Greetings Stamp Set!!! Please leave me a comment letting me know which is your favorite new stamp set this week for your chance to win them! I'll announce the winner on Monday so stop back to see if you've won! Hello, Hello, Hello!!! Today is so exciting and the last day of sneak peaks for the My Craft Spot Stamp Release Party! Wow, what a week of beautiful and amazing projects from Kimberly and the Design Team! If you missed it, be sure to stop by My Craft Spot to check out all the sneak peeks and there is still time to win those fun prizes! Kimberly and Robin have done such an amazing job creating fun Fall Holiday stamps for this stamp release! Today we are sneak peeking the last fall stamp release party set! We've covered Back to School and halloween so can you guess what it is....it is called Happy Thanksgiving!!! Here is my sneak peek! The little turkey is from an old school cart, Animal Kingdom. It is still my favorite Cricut turkey so I use it every year! Thank you so much for stopping by to check out my Sneak Peek projects this week and please join us at My Craft Spot for one more day of fun! The big reveal is tomorrow! You will be able to see and purchase all the new sets/dies and what a better way to end the Stamp Release Party Week than with a super fun Blog Hop! There will be fantastic projects at each stop and not to mention, one of the new Stamp Sets or Dies to be won at each stop!!! See you tomorrow! Hello and welcome to Day 4 of the My Craft Spot Stamp Release Party week! I'm happy you stopped by today to get a closer look at my sneak peek of the the new Ghostly Greetings stamp set! This set is another fun Halloween set and to be honest, I can't decide which is my favorite!! I had so much fun creating this card! It did take some time but the end result was well worth it!! Here is my sneak peek for today! This card took a lot of googly eyes and a lot of different sized glue dots to create! I started by placing the largest ones and worked down in size. The smallest two sizes were glued into place using little dots of Tombow momo multi glue. My daughter's squealed in delight over the finished card! This is just one of the adorable ghostly sentiments on this set! Like I said earlier, it is so hard to pick a favorite set from this release! I stamped it then punched it out and doodled around the edge. It is popped up over top the Toadally Green My Craft Spot Crinkle Ribbon. Here is a fun look at the dimension on the eyes! Inside the card is the "Happy Halloween" stamp from this set. Stop by My Craft Spot for your chance to win another great prize today and for some more amazing Halloween inspiration from the talented Kimberly as well as the My Craft Spot Design Team!! We can not wait for you to see the big reveal on Saturday! Thanks for stopping by today and please stop back again tomorrow for our last day of sneek peaks! Hello Everyone! Welcome to Day 3 of our week long Stamp Release Party at My Craft Spot! We are half way through the week and what do you think so far? Have you been inspired and are you excited for the big reveal on Saturday? Well, today we are sneak peeking the another new Halloween set called Best Witches to You and what an super fun set this is to have in your collection! This ghost from Paper Dolls Dress up is one of my all time favorites! I think I use it in some manner every year! This card is a simple black and white with lots of layers and doodling! This cute little sentiment is layered on and accented with a Midnight Black Crinkle Ribbon accent and Black Twinery Twine bow! I used my Gypsy to weld two ghosts together to form the base then I popped each layer with dimensionals. 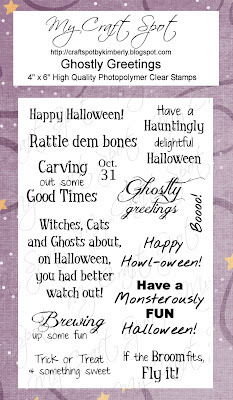 This adorable inside sentiment is a combination of two stamps from the new Best Witches to You! I love it! 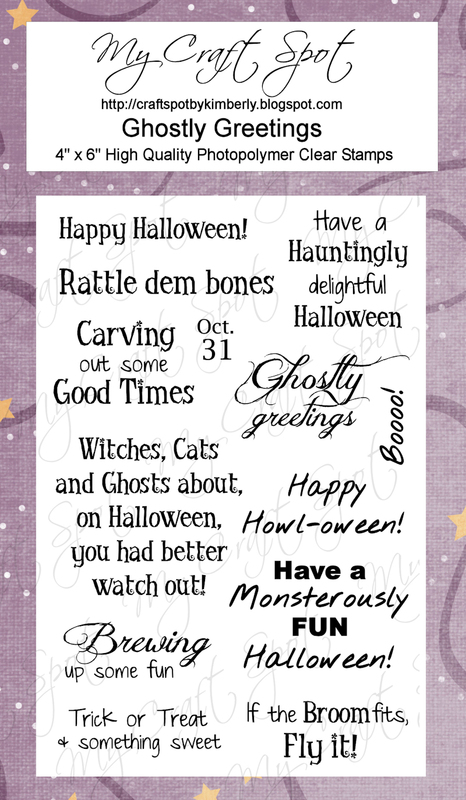 I hope this insires some fun Halloween cards for you! All the new sets will be revealed and available for purchase on Saturday but make sure to check out all the beautiful projects today using Best Witches to You at My Craft Spot! Thanks for stopping by today and please stop back again tomorrow for another sneak peek!